Parachute Coconut Butter Smooth Body Lotion - Effective or Not ? Home ReviewsBeauty Parachute Coconut Butter Smooth Body Lotion – Effective or Not ? 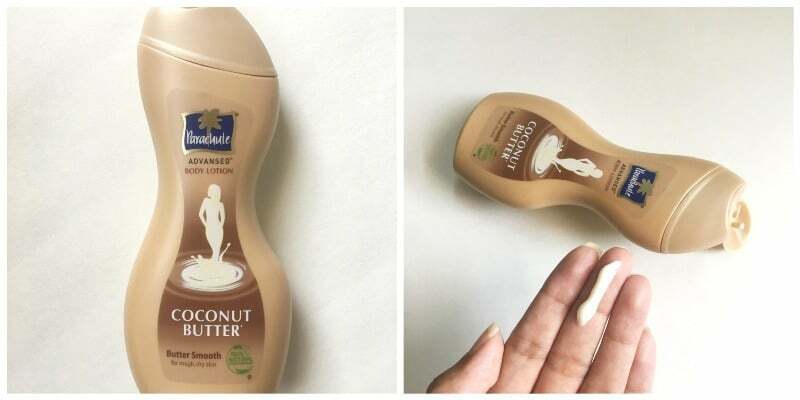 Parachute Coconut Butter Smooth Body Lotion – Effective or Not ? Who is it for? Parachute Coconut Butter Smooth Body Lotion is for those struggling to find a lightweight body lotion that is apt for summer months or for dry skin due to staying in air conditioners. Apply this moisturizer all over the body after a shower so that it gets absorbed properly into the skin. No, but it does mention that it is for people with age above 3 years. This moisturizer comes in a light brown plastic body with a flip to open cap. The bottle has a curvy shape, which resembles a female human body. The 100ml bottle is quite compact and is ideal for traveling. The moisturizer is light and pretty smooth, making it easier to apply. It isn’t too thick or runny. When applied after a shower, it gets absorbed into the skin easily without leaving behind an oil or stickiness. It has a very mild fragrance which is both like shea butter and coconut. It contains artificial fragrance as well. The moisturizer gets absorbed easily and is lightweight on the skin. The coverage is good as it isn’t too thick in consistency. Though it hydrates the skin, it does not stay for a very long time. So people with really dry skin may not find it effective. Also, I feel it is good for the summer dryness but it may not survive the harsh winters. Therefore, it isn’t really for people with really dry and rough skin. I liked its mild and not so overpowering fragrance. I did not like that it has parabens and artificial fragrances. Apt for skin dryness in summers. Does not keep the skin hydrated for a long time. Not for people with really dry and rough skin. Yes, it is not a bad option for the summer months but I wouldn’t recommend it to people with really dry skin. Parachute Hair Oil: Advansed Scalp Therapie ?! !